Conventional radioaerosol delivery systems utilise venturi nebulizers that deliver a broad spectrum of particle sizes at high pressure to the patient in the range of 1 to 5 microns, with an MMAD of 3-4 microns. 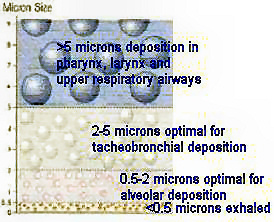 In order to achieve satisfactory alveolar deposition, systems based on the venturi principle require the large particles to be removed before the patient breathes in the aerosol. Incorporating baffles, settling bags or subjecting the airflow within the nebulizer to a swirling pattern may achieve this. These systems suffer from inefficient use of the Tc-99m DTPA, as the 'dead volume' is typically 50% or more of the added dose. 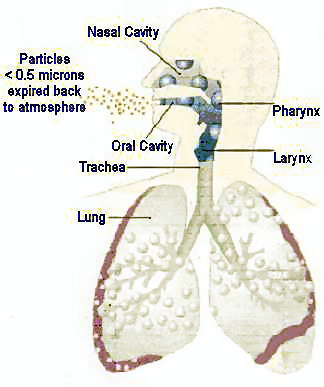 Moreover, due to the relatively high particle size variation of these systems, a significant proportion of the generated aerosol is unusable, as the circuit will baffle it out. Systems with inadequate baffling will result in poorer image quality with relatively high uptake in the throat, oesophagus, stomach and central airways. SmartVent does not suffer from these inefficiencies. The starting MMAD is 2.2 microns at the generator level, with a delivered MMAD of 1-1.5 microns. This, combined with the virtual zero dead volume, results in a delivery efficiency that is 4 to 8 times better than conventional radioaerosol delivery systems, with exceptional image quality.